This is a photo of the most dangerous part of our Mont Blanc climb: the Grand Couloir. It’s sometimes referred to as the “corridor of death”. 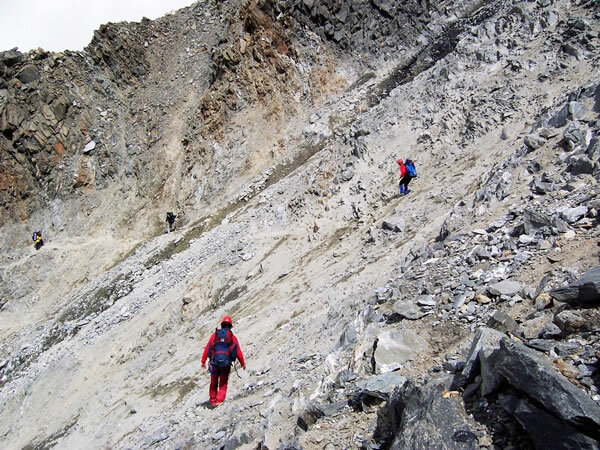 Almost every year falling rocks kill climbers crossing the couloir. As a result, we ran as fast as we could from the spot where the climber with the yellow jacket is standing, across the couloir, to a point near the man in red who’s nearest the camera. It was, to say the least, a chest-heaving and near heart-stopping exercise.